The level for the apple juice consumer fell the lowest, to 50. The level for the applesauce eater went down to 61, while the whole apple eater had a high 66 level as his lowest point. Note that the blood sugar levels peaked for all three at the same level 30 minutes after eating. Then all levels decreased as sharply as they rose, but each to a different low point. The raw apple eater’s level stayed constant at the high level for the remaining two hours, while the level for the other two stayed at lower values. 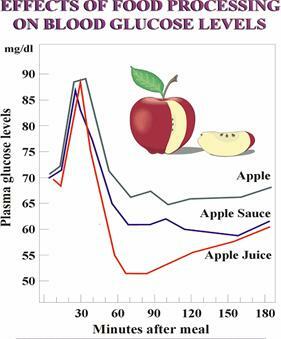 Although this study was done in non-diabetics, the blood sugar peaks are more pronounced (higher) in diabetics consuming the juice or sauce in comparison with the whole apple, thus indicating that the natural whole apple will produce a steadier blood glucose that the body can more easily handle. This study demonstrates that eating food in its natural state is the safest and—ultimately—the most satisfying way to enjoy sugar. Above graph and report, proves that, apple has an inherent quality, of reducing sugar level in normal person also, contrary to the belief so far that, it increases the blood sugar, because it has sugar content in it, and that is why it was not recommended for diabetes control, by anybody. In the above experiment 3 forms of apple are tested on a normal person and results give are as under :-. When Apple juice is given, the blood sugar is reduced from 90 to 50 counts in 30 minutes, in normal person, that means 40 counts are reduced in 30 minutes, in spite of normal insulin level available to reduce the sugar, so the major difference is clearly due to inherent quality of apple to reduce the sugar, that is positively confirmed. I have proved the same phenomena of apple, having inherent quality of reducing sugar in Diabetes ,with factual data by experimenting on myself. That too by eating food with different glycemic index viz. sugar, sweets, ice cream and many other fruits or food. but the reduction of sugar to normal level was little delayed in timing, with a good control of sugar, that too without any side effects. The duration of control also depends on the simple or chronic condition of the patients, in simple type you get normal control within 10 to 15 days but in chronic condition of diabetes, it may take about 1 or 2 months. This time effect is naturally due to apple taking time, to improve the impaired system of our body, so give some time to apple to act effectively, instead of expecting it immediately. This factor I have studied on so many people. My experiments, conclusively proves that, the same inherent quality, present in apple for reducing sugar in diabetes, is as good as shown in normal person. I think this has nothing to do with Glycemic index but the action of, total vital ingredients of apple, on our body metabolism . This is amply proved by the effects of apple in other various major diseases. Actually Sorbitol and Malic acid which are abundant in apple, are recommended as allopathic medicine for diabetes, do you know this. 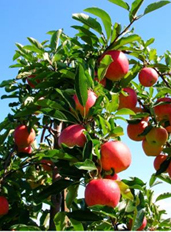 My recommendations of walking and Vitamin B Complex serves as an additional booster, for fast action of apple, in lowering sugar.